STOP PRESS: The Crucible (BBC, 1981) is being screened in the Classics on TV: Great American Playwrights season at BFI Southbank in January 2015. Read more and book your ticket for the screening at 7.40pm on Tuesday 20 January 2015 by following this link. There were two other productions of The Crucible in subsequent decades. 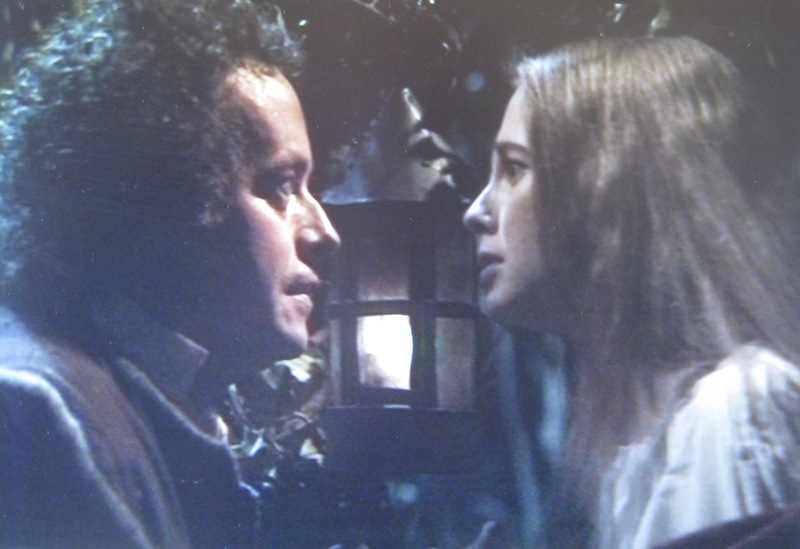 In 1968 Alex Segal directed a modern adaptation of The Crucible for Rediffusion in association with the American television network CBS. (Segal had been named ‘Television Director of 1966’ by the Directors Guild of America for his work on a 1966 CBS production of another of Miller’s play, Death of a Salesman: Susan C. W. Abbotson, Critical Companion to Arthur Miller: A Literary Reference to his Life and Work, New York, 2007, p. 124). The Rediffusion production (now lost), which had a mixed British and American cast, was transmitted four years after a BBC Radio production of the play had failed effectively to evoke through sound alone the necessary sense of community and panic, and two years after the BBC had presented a so-so television adaptation of Miller’s novel Focus in the Theatre 625 strand (BBC2, 24 December 1966: see J. C. Trewin’s review, ‘Drama and Light Entertainment’, The Listener, 3 February 1966, p. 183). The Crucible was Rediffusion’s second production of a Miller play, following on from Joan Kemp-Welch’s production of A View from the Bridge of 1966 (the two known television productions of this play will be the subject of my next and final blog post in this Miller case study). More than a decade later in 1981, in response to the third television production of The Crucible which was made by the BBC, Michael Church intriguingly suggested in The Times that Miller ‘has hitherto never allowed The Crucible to be televised, rightly fearing its fatal diminution in the streamlining process through which even the best directors put classics’ (‘The Crucible, BBC 1’, The Times, 13 April 1981, p. 7). This seems to suggest that Miller’s permission wasn’t directly sought by the independent television companies for their productions; however, as noted in my previous blog post, on the Granada productions of the late 1950s, Miller explicitly stated in a 1960 interview that it was precisely because of Granada’s willingness to screen his plays ‘at full length’ that he granted permission for these productions to be made (Arnold Zeitlin, ‘Why You Can’t See an Arthur Miller Play’, Pittsburgh Post-Gazette, 4 October 1960, p. 56). Derek Granger wrote in to The Listener to state that the BBC had been wrong to announce the 1981 Crucible as a ‘World Television Premiere’ (‘Miller’s Tale’, 7 May 1981, p. 610) – and he was in a very good place to know this, having been head of Granada’s play department at the time of the 1959 transmission. 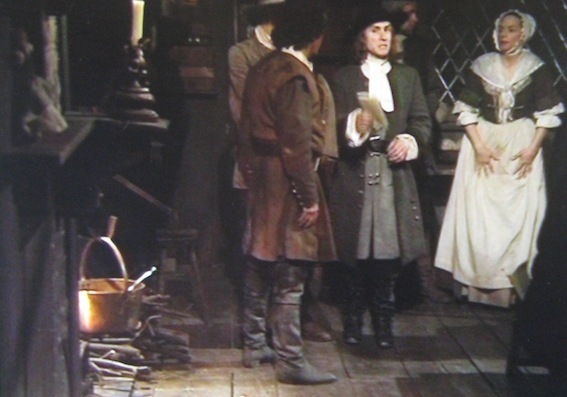 Louis Marks, the producer of the BBC’s Crucible, however, was moved to question Granger’s claim that Granada had in fact presented Miller’s play at all, on the basis that the 78-minute production must have drawn on less than half of the text. Marks continued, ‘We never claimed that ours was the first ever television production, merely that it was the first time the play had been presented in its full form. Arthur Miller’s own view is that the play suffers greatly from heavy cutting and results in little more than what he terms “scenes from the play” ’ (Louis Marks, ‘Miller’s Tale’, The Listener, 28 May 1981, p. 712; my emphasis) – a statement which offers food for thought when thinking through the textual cutting which is often felt to be necessary in the process of adaptation of a theatre script for effective performance on the small screen. Despite this slight bickering in the press, it is at least clear that in 1981 the BBC presented the play entirely unabridged, and that this was at Miller’s request (The Guardian, 11 April 1981, p. 18). Indeed, the production was said to have carried Miller’s ‘special blessing’ (Michael Church, ‘Television’, The Times, 8 June 1981, p. 11). This accomplished studio production – a 170-minute transmission in two parts on one evening (Sunday 12 April 1981), with a ten-minute news programme serving as interval – not only presents the text word-for-word but also adheres closely to Miller’s famously detailed and extensive stage directions. Only occasionally does it depart from these and always for good televisual effect, as I discuss below. Act 1 is a little creaky around the edges, but the action being concentrated (as Miller specifies) in one, rather bare, bedroom in the home of Reverend Parris, a useful intensity is built up which provides a solid base for the exploration of motivation of several characters in the promulgation of the central lie of the play. Revd Parris is deeply concerned for his own reputation, having stumbled across his daughter Betty, niece Abigail and many other girls ‘dancing like heathen’ (p. 231 of the 2009 Methuen edition of the text) in the forest, a practice which has led to a rumour of witchcraft in the community. When questioning Abigail (Sarah Berger) about this, begging her to tell him of ‘whatever abomination you have done’, Parris (Denis Quilley) stands behind her; he cannot see her face, but the audience sees that her face betrays nothing at all of her falsehood. She does, however, express some emotion when he relates how Goody [=Goodwife] Proctor, in whose house she used to work, has described her as ‘soiled’: her expression quivers momentarily, but immediately she regains her composure and disputes this accusation (232; see adjacent image). ‘I want the light of God, I want the sweet love of Jesus! I danced for the Devil; I saw him; I wrote in his book; I go back to Jesus; I kiss His hand. I saw Sarah Good with the Devil! I saw Goody Osburn with the Devil! I saw Bridget Bishop with the Devil!’ (259). There is a solidity and warmth in the set, but it is also a little austere. The darkness and heavy wooden furniture underscore Proctor’s complaint that ‘It’s winter in here yet’, whilst the big open hearth and roaring fire in the centre of the room suggests that deep down there may still be love between husband and wife, just as there is warmth beneath the soil he has lately been tilling on the farm (‘It’s warm as blood beneath the clods’, 262). It is springtime in Salem, the farm is coming to life and he talks of summer. ‘You ought to bring some flowers in the house’, he says, and she promises to, ‘tomorrow’. This metaphor for the current coolness of their marital relationship is brought yet further into focus when they move to the doorway to look out upon the garden in the evening. A lilac tree is visible on the left of the frame as they emerge outside. It remains partially in shot as the camera observes their gaze. The evening light falls brightly on their faces and they take in the view against the backdrop of birdsong. But as Proctor notes that ‘Lilacs have a purple smell. Lilac is the smell of nightfall, I think. Massachusetts is a beauty in the spring!’ Elizabeth’s face falls and she swiftly turns and re-enters the house. The purple lilac, a symbol of the early stages of romantic love, here reminds the wife painfully of her husband’s infidelity with the young Abigail, former employee of the household. The marital relationship has yet to emerge from the winter caused by his infidelity and, perhaps Elizabeth fears, all is fully in bloom and full of promise between Proctor and Abigail. For a production that follows both the words of the text and the playwright’s extensive stage directions so faithfully, it is notable here how the production makes a diversion in order to emphasize visually the potency and weight of the words in this scene, especially the symbolism of the lilac. Miller indicates that Proctor ‘goes and looks up at the sky through the open doorway. […] She [Elizabeth] is watching him from the table as he stands there absorbing the night’ (262). But by having Elizabeth join him at the open door, there is for just a moment the sense that husband and wife are, or are soon to be, at peace. They are looking in the same direction, shoulder to shoulder, even if they do not make eye contact; and yet, following the mention of the lilac, when they return indoors the gulf that separates them is starker than ever. As he returns indoors, night swiftly falls; he lights candles and the room becomes much brighter. The generous size of the set for the Proctors’ main living space comes into its own as the act progresses and the camerawork emphasizes the fear and uncertainty in the community regarding the accusations of witchcraft by focusing on small groupings of people from different positions. When the court officials come to question Elizabeth following an accusation of witchcraft (made by Abigail), the camera is positioned close to the wall of the fireplace on which a poppet, or doll, sits on the mantelpiece. As can be seen in the adjacent image, clever use of perspective has the poppet – which will be a crucial piece of evidence – foregrounded left whilst Elizabeth is asked whether she owns any such poppets. She says no, at first, then when the poppet is spotted, she walks towards it – and the camera. The interiority of this studio production is typical of Don Taylor’s productions of stage plays in that it does not often or extensively go beyond the confines of the imaginative space outlined within the play. So, when Elizabeth is taken outside and chained to the cart, the cameras don’t follow Proctor when he demands, unsuccessfully, that she not be chained. The cameras remain ‘indoors’, offering the audience the experience of the characters who remain there, listening. The imaginative use of outside space in this play is important: it is where Proctor and Abigail consumated their passion; it is where the girls, together with Tituba, had been found to be dancing and engaged in witchcraft-like practices. The production therefore opens with a view of a misty forest in darkness, a visual reminder of the forest in which they cavorted. This view is used again as an act-divider between Acts 1 and 2. It appears again at the end of Act 2 but at this point it develops into a scene of its own, a scene which was new to me and which I describe below. After the close of Act 3, the camera lingers on the forest view until a figure appears in the distance and walks to the clearing. It is John Proctor. Abigail, with her hair loose and in her nightwear, joins him and we learn that he has summoned her here. This scene was a surprise to me for it does not appear in the usual editions of the play, but it is one that Miller, at some point, wrote. For Corinna Adam, writing in The Listener, its inclusion was a mistake: ‘Perhaps the decision to include it was a scholarly one. But by making it clear that John’s explanation of the deadly game – that it is all pretence – is the only right one, much of the central mystery of the play was lost’ (Corinna Adam, ‘Broadcasting and the Arts: Television’, The Listener, 16 April 1981, p. 518). It is a strange scene, for sure, but I don’t agree with Adam’s estimation of its contribution to the drama. We know from the private conversations of Act 1 that Abigail and the other girls are engaged in pretence. In this scene, however, she seems to uphold the pretence even in front of Proctor, referring to her new-found social potency almost as if it were divinely sanctioned, seeming to believe in the myth that she originally fabricated in order to protect herself from censure. Here she uses the myth in an attempt to get what she wants in a way which not only shows her as self-serving to the detriment of others (for example, his wife, who is now in jail) but also, I think, psychologically disturbed: she will not stop, she says, until all the ‘liars’ and ‘hypocrites’ of the town are dead, until she has ‘scrubbed the world clean’. She accuses John, too, of hypocrisy but declares herself his personal saviour (‘I will save you tomorrow. From yourself I will save you’), because, she says, through their sexual encounters he purged her and brought her to knowledge: ‘It was a fire you walked me through and all my ignorance was burned away. It was a fire, John, we lay in fire’. Abigail, this scene suggests to me, is dangerous not just because she is determined to save herself and extinguish her romantic competition but also because she appears to be highly unbalanced with a grandiose perception of herself. This builds on the words she spoke to him in private in the first act: ‘I look for John Proctor that took me from my sleep and put knowledge in my heart! I never knew what pretense [sic] Salem was, I never knew the lying lessons I was taught by all these Christian women and their covenanted men! And now you bid me tear the light out of my eyes?’ (241). Interestingly, this speech is followed by the sound of a psalm being sung below, and in a stage direction Miller explicitly states that the words ‘going up to Jesus’ are sung. It is almost as if Abigail, in this heightened moment with her former lover who at this point rejects her, has taken her cue from the psalm. Her elaborate attempt to win him back and replace his wife draws the social currency that is most powerful within her community: although she has learned from him to critique the community’s Christianity, she knows that she must appeal to their religiosity – to ‘go up to Jesus’ – in order to protect herself and remove Proctor’s wife from the equation. 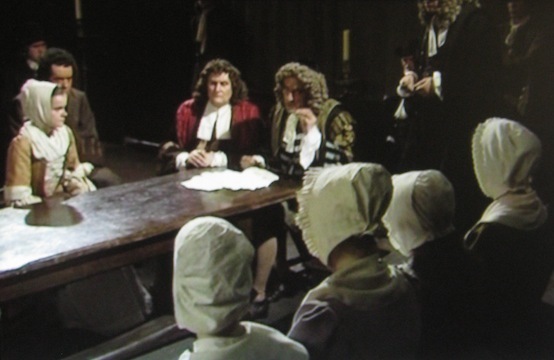 The second part of this two-part production – shown either side of a news bulletin across one evening – opens with Act 3, the scene of which is the vestry room of the Salem meeting house which is serving as the anteroom of the General Court. Miller specifies that the set is to be ‘solemn, even forbidding’ in order to represent the shift at this point from the domestic to the public (285). The first shot is down from the rafters onto an empty throne-like chair and a long wooden table and the second takes in the empty table from ground level. The court proceedings are heard at a distance for a few seconds before they erupt into the anteroom. The long table functions effectively as a structuring device for the court’s more intimate resumption in the anteroom. When Mary Warren, the Proctors’ young servant who has come with John to retract her words, declaring that the other girls are fabricating their testimony, it stands for the great gulf she is setting up between her and her peers (see adjacent image), but it does not protect her feeling the pressure and threat from Abigail. As the emotion builds to a crescendo they, following Abigail’s lead, begin to imitate her voice and actions – a display which the authorities interpret as Mary sending her spirit out to control the girls. This performance, and the authorities reaction to it, so intimidates Mary that she retracts her statement and rushes to the other side of the table into Abigail’s open embrace. At this point in the drama, the only card John Proctor has left to play is the knowledge that Abigail is largely driven by her desire to replace Elizabeth as his wife. This involves outing himself as an adulterer. 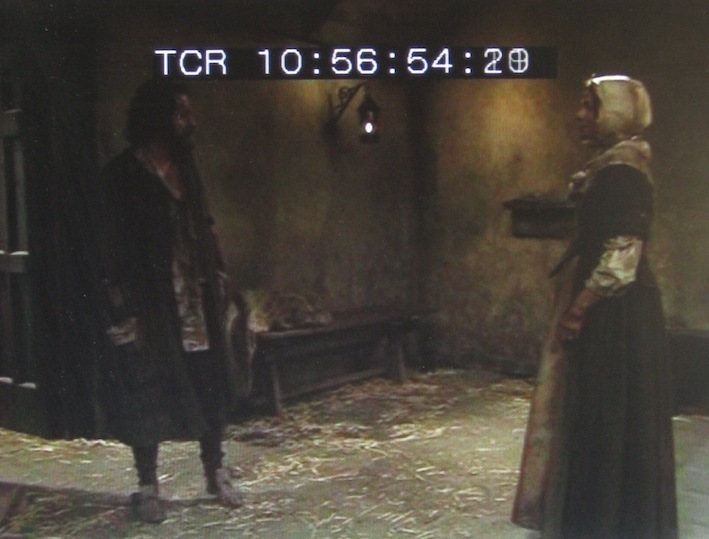 She denies it, and the resulting scene in which Elizabeth is brought in to be questioned about this is powerfully arranged with John and Abigail standing on either side of the table facing towards the camera. 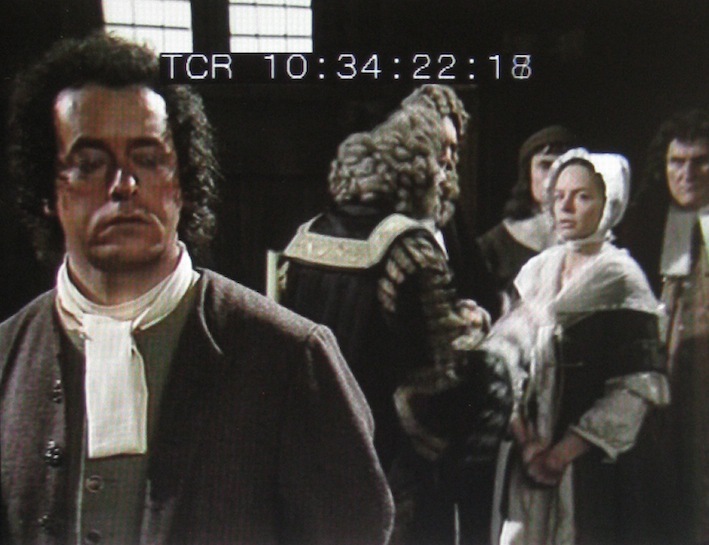 The camera lingers more closely on John’s pained expression when Elizabeth enters only to deny that her husband is an adulterer (see adjacent image). Act 3 culminates in John’s furious, desperate cry that the authorities ‘are pulling Heaven down and raising up a whore!’, on which his hands are bound and he looks across to the triumphant gaze of Abigail who glories in the embrace of all her friends (see the very first image published here, above). The dank darkness of a cell in Salem’s jail serves as the setting for the last act. It is the day of John Proctor’s hanging and his wife is persuaded to appeal to him to save his own life by confessing to having bound himself to the service of the Devil (325). The large empty space that hangs between them momentarily when he enters the cell reminds us not only of the three months they have been parted but also of the gulf that separated them in their marriage. It also makes their loving, and sometimes passionate, reunion now all the more potent. Following this touching, intimate scene between husband and wife, in which each, dirty and ravaged from their stay in jail, take some blame for the failings in their marriage, Proctor admits to the authorities for having consorted with the Devil. Frustratingly for them, however, he will not accuse others, arguing that ‘I speak my own sins; I cannot judge another. I have no tongue for it’ (326). He signs his name to this confession but refuses to hand the signed piece of paper over, despite the fact that he will not save his life unless he does so: ‘How may I live without my name? I have given you my soul; leave me my name!’ (328). Elizabeth recognizes that he has now purged himself of the guilt he long felt for his adultery with Abigail and that he is at peace with himself, having also nobly resisted the imperative of accusing others in the community. He is resigned to imminent death and Elizabeth has deep respect for his choice: ‘He have his goodness now’, she says as she presses herself up towards the bars of the window from which she sees him hang (see image adjacent), ‘God forbid I take it from him’ (329). This is an accomplished and thoughtful production of The Crucible. The straightforwardness of the absolute fidelity to the text means it no doubt served as an excellent production for those studying the text as part of school curricula. This fidelity means that there is no hint of the McCarthyism for which it works as an allegory; indeed, the English regional accents used by the residents of Salem mean that the story of the plot, for those viewers coming to the play fresh, may have been divested almost entirely of its historical and allegorical American contexts. It would be absolutely fascinating to learn how Granada had managed these aspects of the play in its production transmitted a little over twenty years earlier. If a viewing copy of the umatic tape master at the BFI ever becomes available rest assured I shall respond on that here! This was a powerful version of the play, using the small screen format to its best advantage in generating the claustrophobic and poisonous atmosphere in Salem as the witchcraft scare intensified. The decision to use the full text was fully justified – I was a little apprehensive of such a long evening and such insistent period detail, but it turned out to be engrossing and compelling. The antique language, the homespun costumes and the deliberate, almost stately, movements of the townsfolk contrasted sharply both with the hysterical accusations of the girls and the grim formality of the judiciary (full-bottomed wigs and all). This would have been considerably weakened by an abridged text. Here we had time to see many people wrestling with their consciences, either fatally relying on their convictions, or reluctantly coming to the conclusion that they had mistaken what was wrong. All this over and above the central tragedy of John and Elizabeth Proctor, which was as wrenching as ever. The interlude in the forest was indeed a surprise, and certainly underscores Abigail’s steely determination and frankly repellent self-confidence. Whether it is convincing that such a meeting could be arranged in the circumstances, I am not so sure, which perhaps weakens the encounter. In fact I wondered if it was not in some sense a fevered dream – but whose? It’s very good to hear your thoughtful analysis of aspects of this production – as with the earlier screenings you’ve been to, Nicholas. I’m intrigued by your idea of the forest interlude as possibly a kind of ‘fevered dream’. So glad to know that you found the nearly three-hour production so engrossing, and thanks again for sharing your thoughts! Amanda’s description ‘inventive and thoughtful’ just about sums up my reaction to the production too. And her careful and precise analysis is entirely borne out by a viewing. I’m not sure that this is among Don Taylor’s most distinguished work, although I admired how precisely he choreographed the cameras, creating striking juxtapositions of close-up shots of the characters. The drama unquestionably held my attention on Tuesday evening, and I greatly appreciated some of the performances, perhaps especially Denis Quilley, Eric Porter and Peter Vaughan. It’s really good to hear how the production struck you, John! Thank you for writing!